This article is about Åre village. There are also articles on Åre Ski Area and Åre Municipality. For other uses, see Åre (disambiguation). Åre (Swedish pronunciation: [²oːrɛ]) is a locality and one of the leading Scandinavian ski resorts situated in Åre Municipality, Jämtland County, Sweden with 1,417 inhabitants in 2010. It is, however, not the seat of the municipality, which is Järpen. 25% of the municipal industry is based on tourism, most notably the downhill skiing and biking resorts in Åre, Duved and Storlien. The growth in tourism has resulted in the development of hotels, recreational and shopping opportunities in the area. 1000 years ago Mount Åre's surrounding areas were inhabited by Vikings. This can be seen in the names of the nearby villages, like Fröå and Ullå, which descend from names of two Norse gods. In the 12th century the Åre Old Church was built and people had to convert from their old beliefs. Saint Olaf the Holy is a historical figure who has influenced the village and for centuries pilgrims passed through the village on their way to Trondheim. Sami people settled in the mid-17th century to take advantage of good reindeer pasture. In the 18th and 19th century the copper mines in Fröå were important industries. Tourism started to grow with the establishment of a railroad in 1882, and Åre's first Grand Hotel was erected in 1896. The kings of Sweden and Norway came to stay in Åre and Storlien for recreational purposes since the 19th century. Åre is situated in Åredalen (Åre Valley), approximately 400 metres (1,300 ft) AMSL at the coastline of Åresjön lake. Through Åre goes the European route E14 and the Mittbanan railway, connecting the larger towns Östersund and Trondheim. Tourism in Åre started as King Oscar II in 1882 supervised construction of the Östersund–Trondheim railway. With this new railway many people came to Åre to breathe the fresh air and to walk to the top of Åreskutan. They were soon known as "air-guests" (Sw. luftgäster). There was no hotel, but in 1888 Albin Wettergren opened a restaurant by the railway station. In 1891 Åre Tourist Station opened and even more guests were attracted to the village. A woman from Östersund saw this increasing tourism as a great opportunity to open a hotel and did so in 1895. It was called "Hotell Åreskutan". Also Albin Wettergren opened a hotel ("Grand Hotell"). These were only a few of all the hotels that were going to be founded in Åre. In 1910, the funicular Åre Bergbana was built and was the third one in Sweden after the one in Skansen in Stockholm (1898) and the one in Kiruna (1907). This was a more convenient way for the air-guests to reach the top of Åreskutan. In 2008 the hotel Copperhill Mountain Lodge opened on the top of the Förberget hill. Designed by American architect Peter Bohlin it is the only mountain hotel in Scandinavia referred to as a Design Hotel. Taking advantage of the Åreskutan fell, Åre Ski Area has become the major center for alpine skiing in Sweden, sporting more than 30 modern ski-lifts. It hosted the Alpine World Championships in 1954, 2007 and 2019, and the annual Jon Olsson Invitational freeskiing competition, ending in 2007. On March 9–10, 2012 the Freestyle FIS World Cup will be held in "slalombacken" close to the village centre. Åre along with Östersund will host the 2021 Special Olympics World Winter Games. It will mark the first time that Sweden have ever hosted the Special Olympics. Åre has also been the site for the alpine events every time Sweden has bid for the organization of the Olympic Winter Games, including for the 1984, 1988, 1992, 1994, 1998, 2002 and 2022. This is because Åre has the only piste in Sweden suitable for top-level downhill races. They are currently jointly bidding with Stockholm for 2026 It will be used for skiing and snowboarding events if Stockholm and Åre are awarded the winter games. it will host para-skiing for the 2026 Winter Paralympics. it will also be the second city to host all three winter multi-sports for the Winter Olympics, Winter Paralympics and the Special Olympics World Winter Games after Nagano, Japan. Åre has since the 1990s become the largest mountainbike resort in Sweden. In 1999 it was the host for the UCI Mountain Bike & Trials World Championships and it hosted the Nordic Championships 2007. There are numerous graded downhill cycling trails. The Åre Bikepark is open from 1 May until 15 October and is the host for the Mayhem Festival. During summer Åre can also sport hiking, paragliding, kayaking, and a golf course about 15 minutes from the village. In July every year there is a multisport competition in Åre – Åre Extreme Challenge. It counts as the Scandinavian championship in multisport. 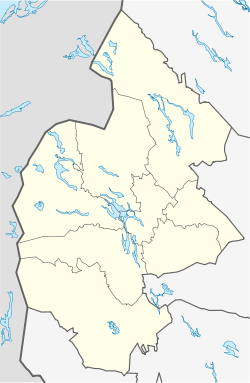 The nearest airport is situated 99 kilometres (62 mi) eastward, on the island of Frösön in Östersund. Åre Östersund Airport is an international airport and the ninth biggest in Sweden with roughly 390 000 passengers (2005). The European route E14 runs through Åre from Trondheim via Östersund to Sundsvall, where it merges with the European route E45. Åre also has a train station. Norrtåg operates the Mittbanan railway from Storlien (where Trondheim-bound diesel trains connect), via Åre and Östersund to Sundsvall. Åre is connected to Stockholm, Gothenburg and Malmö through long distance SJ 3000 (higher-speed trains) and InterCity. Åre is also served by seasonal overnight trains. ^ "Sweden selected to host the 2021 Special Olympics World Winter Games". Special Olympics. Wikimedia Commons has media related to Åre. Wikivoyage has a travel guide for Åre.